Samhain greetings and hedgespells from the edge of these misted, damp dark Dartmoor days! As you’re all bound to be Appreciators of Story and Lovers of the Uncanny, we thought to bring you a small offering from the Hedgespoken basket of witchlore for your enjoyment this All-Hallowed Eve, as we tip into the dark half of the year, and head inwards to firesides and tales with cracklings of imagined others behind us out there in the snow-laden dark. In fact, there are many Baba Yagas. In some tales, she will be described as a Baba Yaga, and you might get to meet her sisters throughout the course of the story. There are many many stories in which she appears, and her hut in the forest becomes like an initiatory cave where you win her approval if you can approach with truth and wits about you. 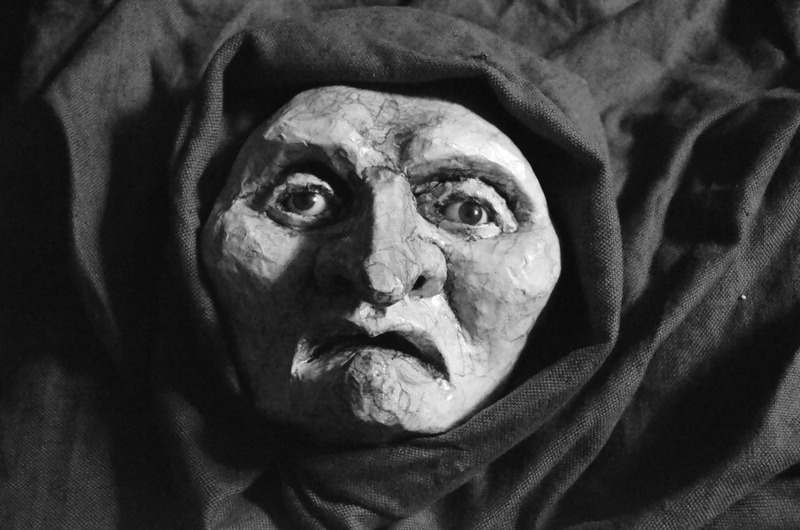 There’s also a deep deep witch-fear, which Baba Yaga represents; she is old as the hills, and cunning. She is kindly Baboushka and terrifying ogress. I created the drawing above for a piece in Marvels & Tales, a peer-reviewed international journal publishing scholarly work dealing with the fairy tale in its diverse manifestations and contexts. 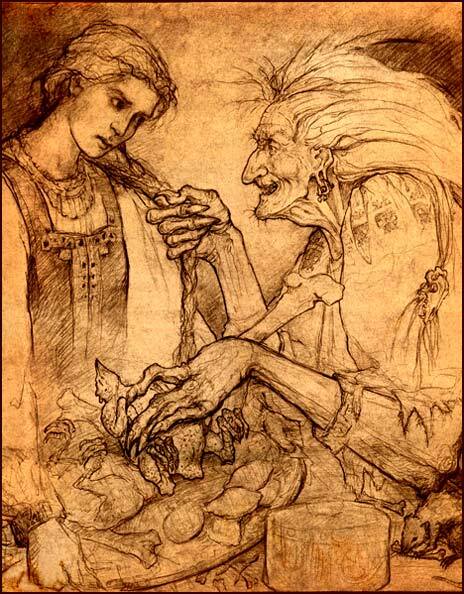 It accompanied my article (and two other drawings of mine) on the old woman in the woods as a fairytale character. 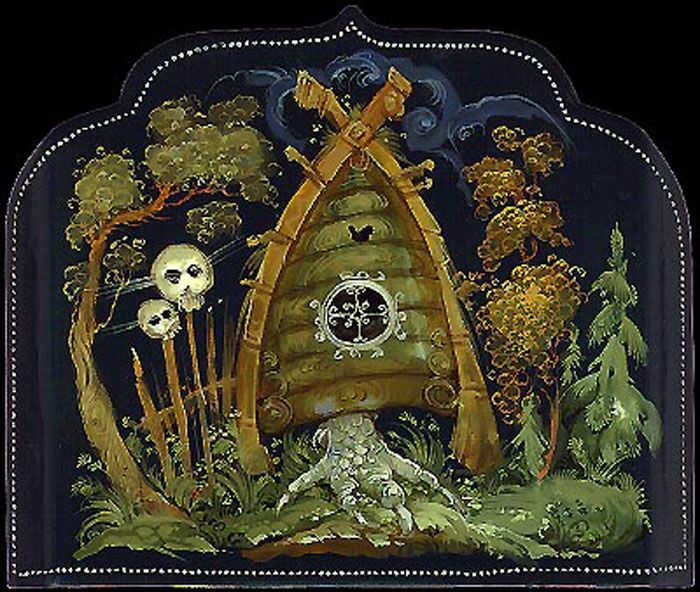 The Baba Yaga below was painted for The Baba Yaga Book – The Wild Witch of the East in Russian Fairy Tales by Sibelan Forrester et al, published by Mississippi University Press. This lavish collection of Baba Yagas in story and art comes highly recommended! The etymology of Baba Yaga’s name is fascinating and ambiguous. Baba is generally agreed to have come from the Slavic word describing an old woman or grandmother, but the second part is more problematic. Various scholars have put forward ideas as to its origins, from the Proto-Slavic *ož and Sanskrit अहि ahi, meaning ‘serpent’ or ‘snake’, to the Saami/Finnish mythological female goddess Akka. 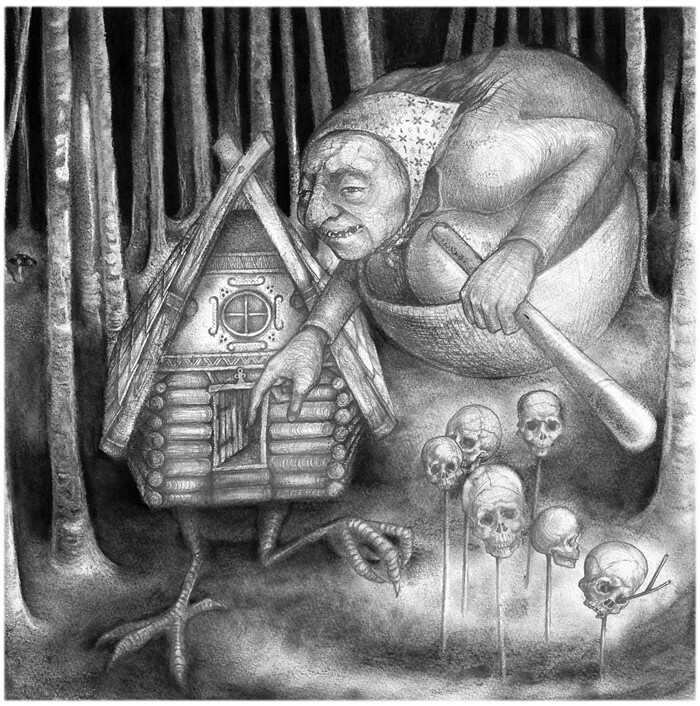 In other Slavic countries Baba Yaga is called by different names, further describing her personality: in Serbian and Croatian she is jeza (‘horror, shudder, chill’), in Slovenian jeza (‘anger’), in Old Czech jězě (‘witch, legendary evil female being’), in modern Czech jezinka (‘wicked wood nymph, dryad’), and in Polish jędza (‘witch, evil woman, fury’). The term appears in Old Church Slavonic as jęza/jędza (meaning ‘disease, illness’). to Lubok – popular Russian prints. Here below she is shown riding a pig into battle against some kind of creature, and below, dancing to the bagpipes! As for filmic Baba Yagas, I wanted to bring your attention to the work of Jessica Oreck of Myriapod Productions, who has created The Vanquishing of the Witch Baba Yaga ~ “Deep in the forest, wedged in cracks in the bark and under the moss covered rocks, hide memories and myths. These subconscious tales, drawn from the natural world, inform the societies we build.” Jessica Oreck’s fantastical work combines animation, traditional storytelling and contemporary non-fiction filmmaking to recount the Slavic fable of the witch Baba Yaga. This fascinating work weaves together the culturally ingrained fear of this mythic witch, Eastern Europe’s turbulent history, and changing society’s perception of nature. SOMEWHERE, I cannot tell you exactly where, but certainly in vast Russia, there lived a peasant with his wife and they had twins — a son and daughter. One day the wife died and the husband mourned over her very sincerely for a long time. One year passed, and two years, and even longer. But there is no order in a house without a woman, and a day came when the man thought, “If I marry again possibly it would turn out all right.” And so he did, and had children by his second wife. The stepmother was envious of the stepson and daughter and began to use them hardly. She scolded them without any reason, sent them away from home as often as she wished, and gave them scarcely enough to eat. Finally she wanted to get rid of them altogether. Do you know what it means to allow a wicked thought to enter one’s heart? The wicked thought grows all the time like a poisonous plant and slowly kills the good thoughts. A wicked feeling was growing in the stepmother’s heart, and she determined to send the children to the witch, thinking sure enough that they would never return. “Well,” very seriously answered the cat, “I will give you a towel and a comb and then you must run away. When you hear the witch running after you, drop the towel behind your back and a large river will appear in place of the towel. The children took the towel and comb and ran away as fast as their feet could possibly carry them. The dogs were after them, but they threw them the cookies that were left; the gates did not open themselves, but the children smoothed them with oil; the birch tree near the path almost scratched their eyes out, but the gentle girl fastened a pretty ribbon to it. So they went farther and farther and ran out of the dark forest into the wide, sunny fields. PS Remember to subscribe to this blog (hedgespoken.wordpress.com) to keep up-to-date with what we’re doing, and please like the facebook page and follow us on twitter to keep involved in the full frenzy of the fray! And don’t forget, you can support our project by donating or sharing from the Hedgespoken Crowdfunding page too. Thankyou so much for this abundance of treasure! 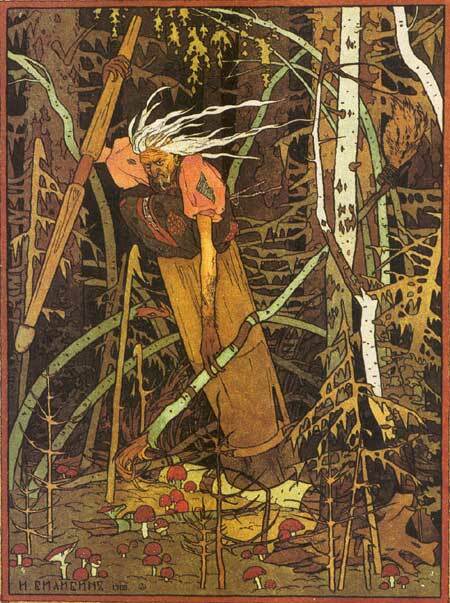 Thank you for this wonderful blog about Baba Yaga. So well written, too. Happy Samhain to you and yours. 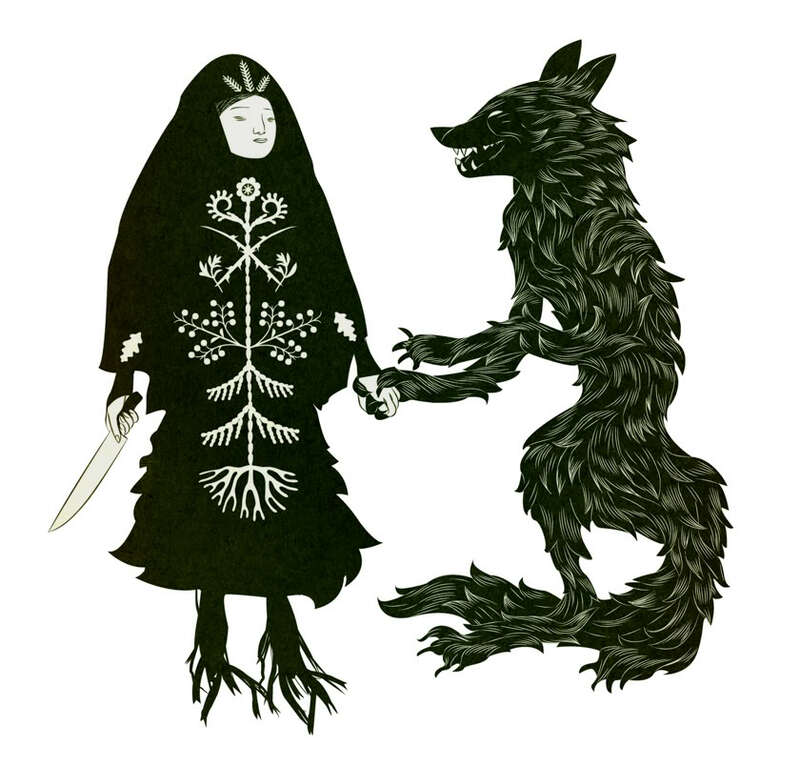 Thank you for these Baba Yaga stories. It’s fun to know how the ideas from our great grandparents and parents time fits into our lives now. My mom always told me that animals and birds are fairys and elves that had to change their shape so they could be safe around people. In my home, when my children were growing, I asked them to be kind to all animals and plants. I asked my kids to take bugs that got lost inside the house back outside so the bugs could get back home. I told my kids that when they did this kindness it built up a pile of good luck for them that would help them in their future when they needed help. Now as adults they still do this and are finding their own ways to be caring. One time a wild deer walked up to my adult sons and let them touch it. Loved your paintings of Baba Yaga! Very deep, a bit scary and real! Did you read per chance Vladimir Propp’s “Morphology of the Folktale”? Thanks all! Glad you’ve enjoyed this! Vanya – no, I haven’t read any Vladimir Propp, tho have known for a long time that I should! 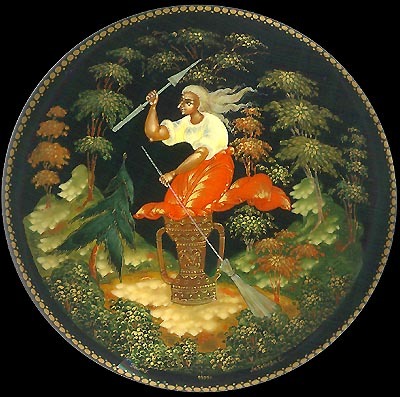 Pleased my paintings ring true :) So often I find non-Slavic artists don’t get enough of the ancientness and fear into their depictions of Baba Yaga. Linda – thanks – that cauldron is fabulous!